Not Your Mama’s Pimento Cheese…es! I can’t begin to remember how many Saturday afternoons mom would call us in for a lunch of chips and her homemade pimento cheese sandwiches. Now this wasn’t just any pimento cheese mind you. It was mama’s pimento cheese. Anyone in Gilbert, America could tell you anything mama touched in the kitchen turned to sheer love. I’m gonna hush up now because we gotta whole lotta cookin’ goin’ on in this HERE post! In a stand mixer, whip the cream cheese. Add mayo and continue to whip until creamy. Add cheese and balance of ingredients and continue to mix until well blended. What can you DO with this Pimento Cheese OTHER than Sandwiches? 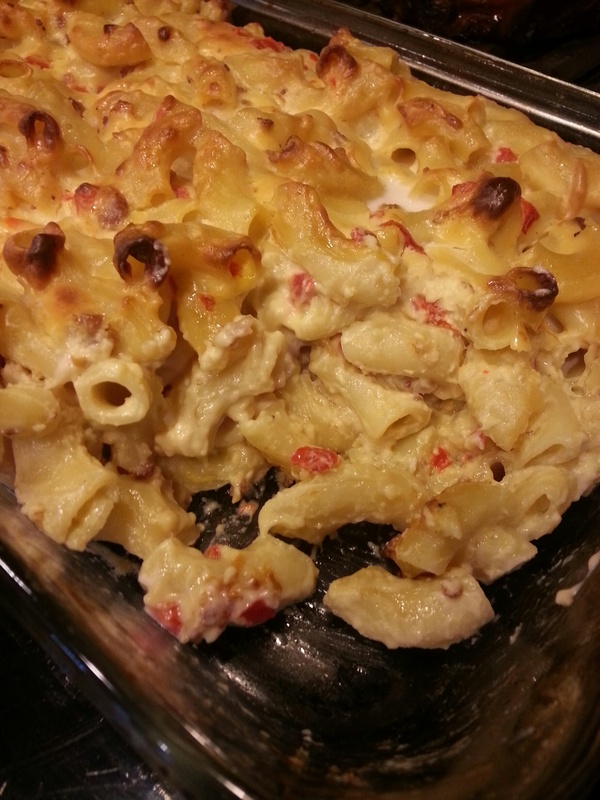 How about Smoked Gouda Pimento Cheese with Bacon Baked Macaroni & Cheese! 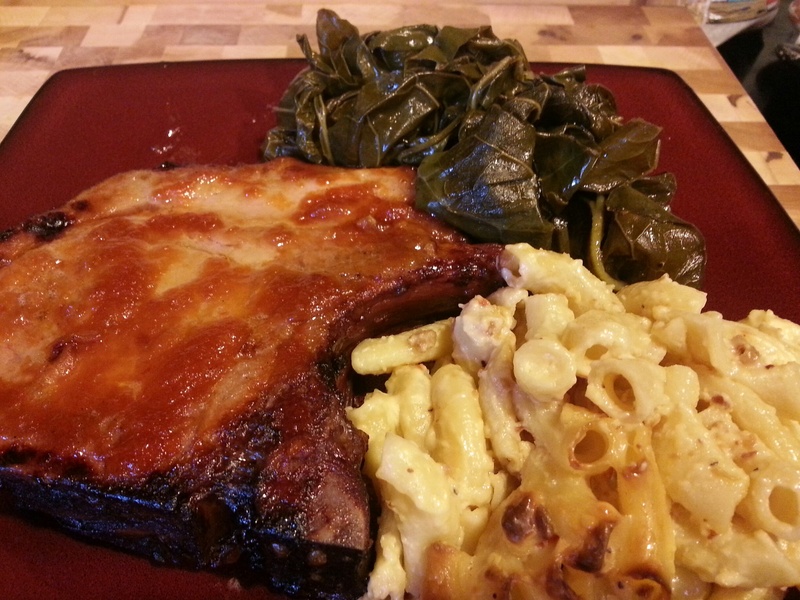 This was served with Fresh Collard Greens and BBQ Pork Chops for Sunday dinner. 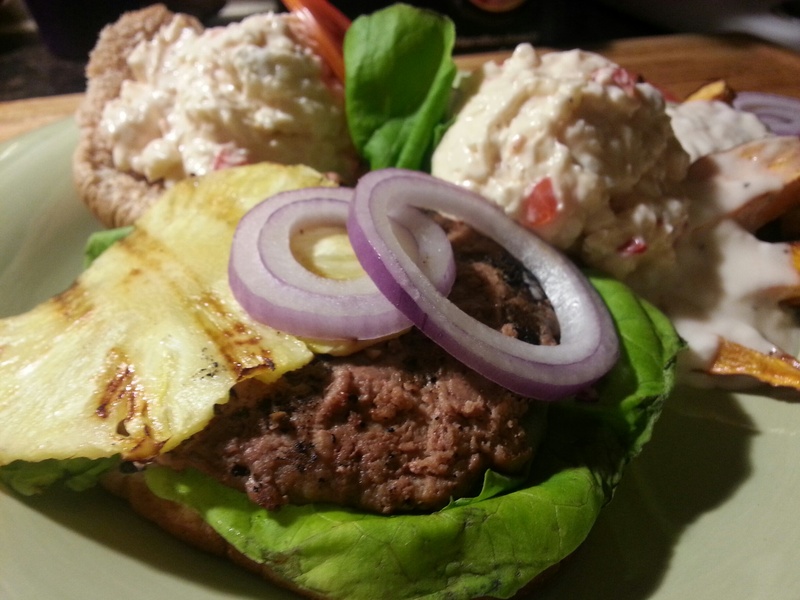 This particular Pimento Cheese is FANTASTIC on Turkey Burgers with Grilled Pineapple and as a topper on Sweet Potato Fries with Sausage Gravy! And, what you’ve been waiting for…. Melt stick of butter by stirring into hot noodles. Mix in batch of pimento cheese and egg. Pour mixture into greased baking dish. Pour milk over casserole and bake at 375 for about 30-40 minutes or until set. Do not overcook, but make sure filling is completely set. Oven times may vary and I check every 5-10 minutes near the end of cooking time. Top with warm, crumbled bacon. Chef’s Note: Cream Cheese was one of mama’s special ingredients. If you like your pimento cheese creamier, you can add more mayo until you reach the desired creaminess and texture. Keep in mind the spread will firm up more as it refrigerates. You can also substitute the cream cheese with sour cream, ricotta or plain Greek Yogurt. With the base recipe given, this is one you can play with substitutions until you have created one that fits you perfectly! I like easy. Bon Appetit y’all!